The week's first inflation report, the June PPI - ahead of tomorrow's even more anticipated CPI - has come in and it has come in hot and well ahead of expectations on both a monthly and annual basis: headline PPI rose 0.3%, above the 0.2% expected, if modestly below last month's 0.5% surge, while on an annual basis, PPI increased a whopping 3.4%, well above the 3.1% consensus and May print, and highest level since Nov 2011. Energy goods and Trade services rose most MoM, but Food prices dropped 1.1% MoM. Core PPI, ex food and energy, rose 0.3% on the month (exp. 0.2%) and 2.8% Y/Y, a big jump from May's 2.4%, and also well ahead of expectations of 2.6%. According to the report, more than 40% of the increase in the index was due to higher retail margins for fuel. 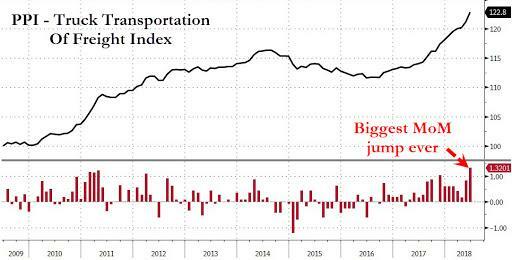 The gain also reflected a 1.3%MoM jump in truck transportation of freight, the largest in data back to July 2009. Another key factor in the June increase in prices for final demand goods was the index for motor vehicles, which moved up 0.4 percent. In contrast, the cost of goods rose 0.1 percent in June from a month earlier, reflecting cooling energy prices, after a 1 percent May surge. Final demand services: Prices for final demand services moved up 0.4 percent in June, the largest advance since a 0.5-percent rise in January. In June, half of the broad-based increase in the index for final demand services can be traced to margins for final demand trade services, which climbed 0.7 percent. Prices for final demand services less trade, transportation, and warehousing and for final demand transportation and warehousing services rose 0.3 percent and 0.5 percent, respectively. Final demand goods: Prices for final demand goods edged up 0.1 percent in June following a 1.0-percent rise in May. Leading the June increase, the index for final demand goods less foods and energy advanced 0.3 percent. Prices for final demand energy climbed 0.8 percent. 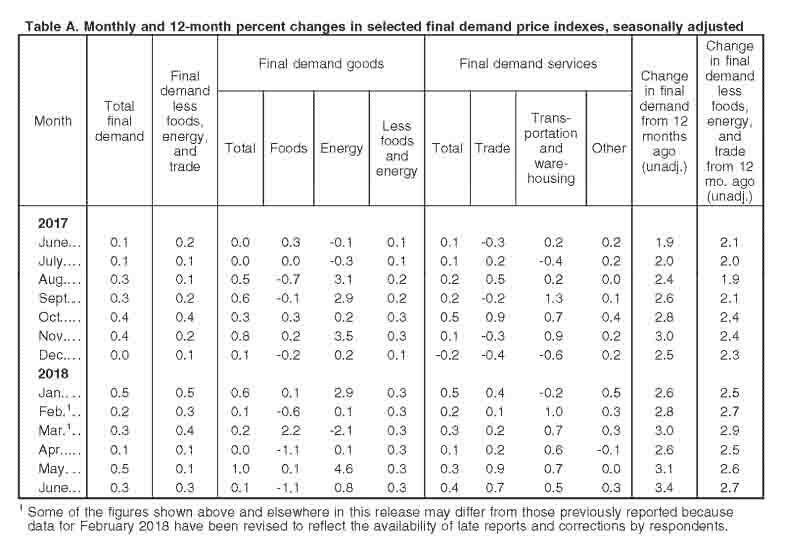 In contrast, the index for final demand foods fell 1.1 percent. Product detail: A major factor in the June increase in prices for final demand goods was the index for motor vehicles, which moved up 0.4 percent. Prices for diesel fuel, electric power, industrial chemicals, and fresh fruits and melons also advanced. Conversely, prices for fresh and dry vegetables dropped 13.8 percent. The indexes for corn, pharmaceutical preparations, and residential natural gas also moved lower. 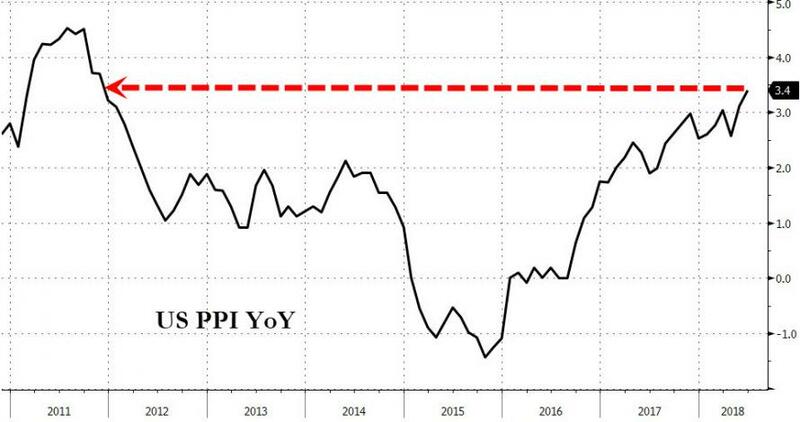 Certainly another high inflation print that The Fed will have trouble ignoring if it wants to tilt to a dovish hike. The bond market has certainly noticed, and the PPI report promptly sent 10Y yields to session highs.